On September 30th, Google made a big change to the information they display about your school: they’re pulling statistics from College Scorecard. Google can now display your school’s average tuition, and acceptance rate, and student completion rate. When available, this information appears in the Knowledge Graph – Google’s shortcut for info in the search results. In other words, before your prospective students and their families even visit your website, they know whether your school is making the grade with course completion and career placement. 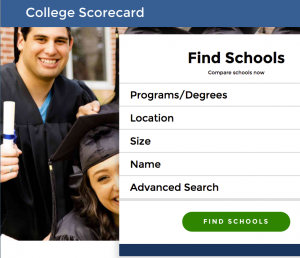 The College Scorecard is web-based software built by the US Department of Education. Basically, it displays information about post-secondary institutions in an easy-to-read format. It’s been around in its current form for a year, but people would have to go to the site to see the data and compare institutions. Now, as Mr King says, it’s front and center. This is because Google has partnered with the DoE so that information on over 7000 Title IV schools to put the College Scorecard information right in the search results. The challenge for private post-secondary institutions is that the College Scorecard may not include information about your school. At ER, we searched our clients on Google, and many didn’t have College Scorecard data in the Knowledge Graph. We see this as an opportunity. To include your data in College Scorecard, you need to add it to the Integrated Postsecondary Education Data System (IPEDS). The DoE has set up a useful web page to help you with this task. However, be aware that IPEDS has time windows when they accept data, and one just passed on September 15th. So you may not be able to submit your data and have it appear in the College Scorecard right away . At Enrollment Resources, we know that proprietary schools are great! We want to help you level the playing field so that you attract as many qualified students as you can. That is why we believe that this is a great opportunity to show your strengths.